8/19/2009 – Remember the study we showed you in one of our Chess Classic reports? The one which top grandmasters failed to solve, while the program Rybka succeeded in just over a minute? We promised to give you the astonishing solution, which we now do, together with a number of interesting – and sometimes delicate – anecdotes describing how the humans fared. 1-0 for the computers on this one. 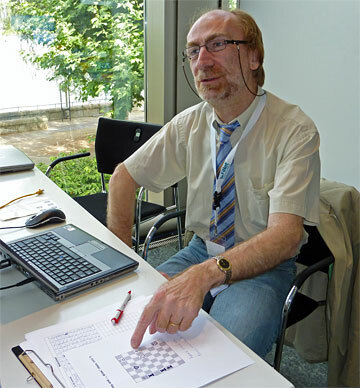 In our report on the Livingston Chess960 Computer World Championship in Mainz earlier this month we showed you a problem which human beings and computers were not supposed to be able to solve. In his book "The King" GM Jan Hein Donner writes: "White makes one more move and it’s a draw! Keres, the two Byrnes, Lothar Schmid, Bisguier and I sat staring at this position for more than half an hour. We couldn’t find it. Can you?" Hans was convinced that computers would also fail miserably. So Frederic Friedel bet him a glas of whisky at the bar that Rybka would find the key move. "Not necessarily understand why it holds the draw," Friedel said, "but it will find the move by discovering that all other moves lose badly and quickly." Hans lost his bet, Rybka found the right strategy in one minute and two seconds. Before we give you the very interesting solution (and release a large number of readers from their suffering) here are some of the top grandmasters who wrestled with the problem in Mainz, and some cute little stories surrounding their efforts. One of the first players we showed the problem to was Levon Aronian (on the right in the above picture) between his games in the GrenkeLeasing Rapid World Championship. He solved it instantly, but with a little confession: "I know this position, I have read the Donner book!" Lev had a prediction: "Show it to Gabriel Sargissian," he said [Gabriel is his second, left in the picture above]. "That guy is a problem solving wonder. He gets any study and any problem immediately. It's a miracle." No he doesn't. Gabriel was unable to find the solution, and after some taunting by Levon and us he asked for us to reveal it. Which we did. Next we showed the problem to Evgeny Najer, rated 2663, Daniel Fridman, 2665, and David Navara, 2709 (left to right in the picture above) – and to any number of GMs in the hall. None solved it on the spot. Late that evening Fridman, who spent a lot of time working on it, came up with the solution. 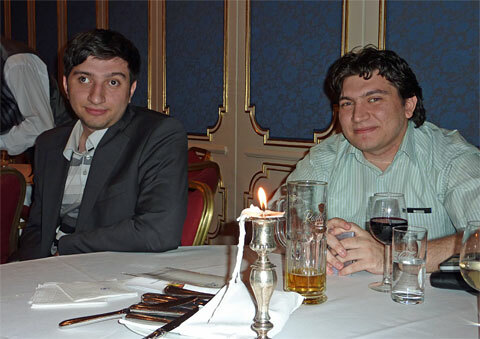 That evening at the Champions' Dinner everyone got to try: in the above picture it is Vugar Gashimov, rated 2740, his brother and manager Sarkhan, IM elect rated 2351, and Viktor Bologan, 2689. At the same table was also Ivan Sokolov, 2655, Ordix Open winner Shakhriyar Mamedyarov, 2717, and other passing GMs. Guess which of the Gashimov brothers solved the puzzle. The one who is weaker at over-the-board chess, by almost 400 Elo points! Sarkhan is a project manager of Hewlett-Packard in Azerbaijan, speaks excellent English and has a great sense of humour. He spells his surname "Hashimov", but that is a Russian thing. We must remember to keep in touch with him. 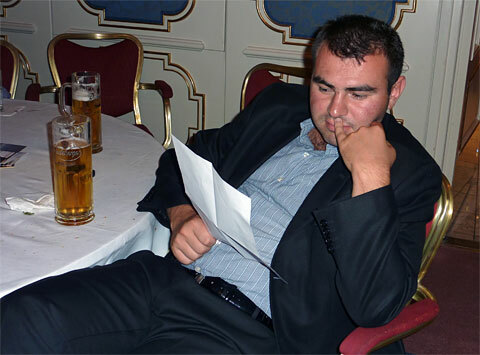 Shakhriyar Mamedyarov was another Super-GM who solved the problem – after a number of local tap beers and some intense brooding over our sheet of paper. Another episode needs to be narrated, but we will keep the protagonists anonymous, for obvious reasons. One top GM we showed the puzzle to – not necessarily one of those mentioned above – worked for a while on the problem and then gave up. Some time later he asked to see it again, and this time, after a few minutes of thinking, a smile broke out on his face and he gave us the correct solution. Very nice. Except that later that evening a young and somewhat distraught lady told us the following: "He came outside and asked us for the solution, and the whimp (Gabriel) told him! He said not to tell you, but I can't allow it to pass." Very devious – but hey, we like that in a man. Finally there is Garry Kasparov, enjoying a vacation on a Mediterranean coast, but still keeping up with the chess news. He called and told us that he had solved the puzzle in a minute or two. "But only because of the big hint you included in the story!" Garry said. His reasoning, as he explained it, was the following: "if Rybka takes over a minute – that long! – to find the solution, in an open position, then there is only one possibility: it must be a perpetual! Once you know that the solution is easy to find...". Good thinking, Garry Kimovitch! Above is Rybka running on a standard quad system: the solution pops up in just 28 seconds, and remains permanently the main line of the program. But what about other engines? This is good ol' Fritz, running on the same quad (at close to ten million positions per second). The program comes up with the solution and stays with it after just 32 seconds. Send us an insoluble study! That's that. Are there any studies that these monsters cannot solve? Anyone who sends us a nice puzzle – something as elegant as the position above – which chess engines cannot figure out, can win a Deep Fritz 11 signed by all the players of the Dortmund tournament. Maximum three. Please use the feedback button on the left side of this page and give "Computer puzzle" as the subject line (anything else may cause your letter to be ignored). And please give us the position and solution in PGN. Rybka 3, the world’s strongest chess program, leads all ranking lists clearly, with ratings well above Elo 3000. The name translates to "little fish", and Rybka is the shooting star of computer chess and the reigning world champion, having won its title in Amsterdam 2007. But strength is not everything. Today the main use of chess software is interactive analysis. Rybka's superior playing strength helps you to quickly assess a position. But analysis with Rybka 3 is much more than just evaluations and best moves. In the user interface designed by ChessBase, Rybka 3 introduces several ground-breaking new analysis features. Note that Rybka 3 includes a database of one million games, and that the purchase of the program entitles you to one year of access to the chess server Playchess.com. Rybka 3 is a UCI engine, with 32 and 64-bit versions included in the package. Rybka can be made the default engine in ChessBase 10. Order Rybka now! A year ago Fritz became the first commercial chess program in history to defeat a reigning World Champion in a formal match. Hundreds of thousands of chess fans followed the event on the Internet. In its games against Vladimir Kramnik Fritz displayed an astonishing degree of strategic understanding, underscoring its reputation as one of the strongest and best-loved chess programs in the world. The new Fritz 11 – now availabe in the ChessBase Shop – has been vastly improved, compared to the version that beat the world champion. Its playing strength has improved by 80 Elo points. But it is also the entire package of new features that will impress chess fans. The program helps you with practical play, training and analysis, and does so in an entertaining way that fosters learning and understanding. 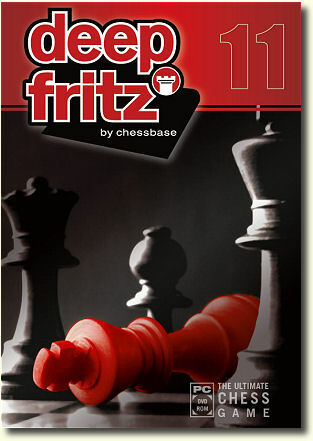 The main Fritz database contains over one million games, ranging from the years 1625 to 2007 – from the early beginnings of chess history to the latest top-level tournaments. The revised and extended openings book is more diverse and better tuned to the strengths and preferences of Fritz. A complete new feature, the “magic eye”, visualizes the thought processes of the engine on the 3D chessboard. You can directly follow the ideas that are going through the “mind” of the program. Here's an interesting article on the Advantages of Deep Fritz 11, written by one of it's programmers, Mathias Feist. System requirements: Pentium III 1.4 GHz or higher, 256 MB RAM, Windows XP or Windows Vista, GeForce5 or compatible graphics card with 128 MB RAM or higher, 100% DirectX compatible sound card, Windows Media Player 9, DVD ROM drive.